Free and open to all, but please register. Light refreshments to follow. Join the Association for Public Art (aPA) for our 146th Annual Meeting at Moore College of Art & Design featuring guest speaker Barbara Haskell, curator at the Whitney Museum of American Art for over 43 years. Haskell organized the Robert Indiana: Beyond Love exhibition at the Whitney in 2013, and the Grant Wood: American Gothic and Other Fables exhibition currently on view. Celebrate the return of LOVE to LOVE Park with aPA and the City of Philadelphia's Office of Arts, Culture and the Creative Economy. 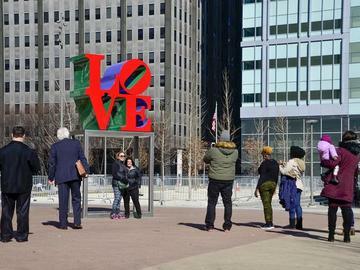 LOVE was recently repainted with its original color scheme and reinstalled after a year out of public view. Questions? Email apa@associationforpublicart.org or call 215-546-7550. Learn more about our annual spring event and past speakers here. This event is free thanks to membership support. Click here to support art for everyone, anytime!